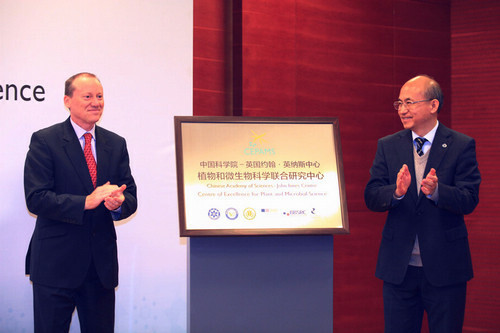 On Wednesday 2 November, the Centre of Excellence for Plant and Microbial Science (CEPAMS), jointly established by the Chinese Academy of Sciences (CAS) and John Innes Centre (JIC, UK), officially launched in Beijing. CAS Vice-President ZHANG Yaping and Martyn Roper, Minister and Deputy Head of Mission at the British Embassy in Beijing, attended the opening ceremony. The centre is a collaboration between the John Innes Centre and two CAS institutes, the Institute of Genetics and Developmental Biology (IGDB) and the Institute of Plant Physiology and Ecology (SIPPE). CEPAMS brings together three world-leading laboratories from the UK and China to tackle global challenges of food security and sustainable health care, and nurture excellent science. Its transnational research team focuses on the improvement of food crops and the production of high-value natural products from plants and microbes. CEPAMS opens its first laboratory at IGDB in Beijing with appointment of Dr. BAI Yang. Dr BAI worked for Max Planck Institute for Plant Breeding Research in Cologne, Germany, before he joined the centre. He will focus his research on plant root-associated microbes and agricultural productivity. CEPAMS has three campuses located in Beijing, Shanghai, and Norwich . As affiliated members of JIC faculty, CEPAMS group leaders have the privilege of conducting their scientific research in collaboration with JIC, to co-operate widely with other members of JIC faculty, and to attend internal academic meetings in JIC. CEPAMS was established with funding from the Chinese Academy of Sciences and the UK Biotechnology and Biological Sciences Research Council (BBSRC), one of the UK’s seven Research Councils. 21 CAS-JIC collaborative research projects have been launched by CEPAMS since 2014.